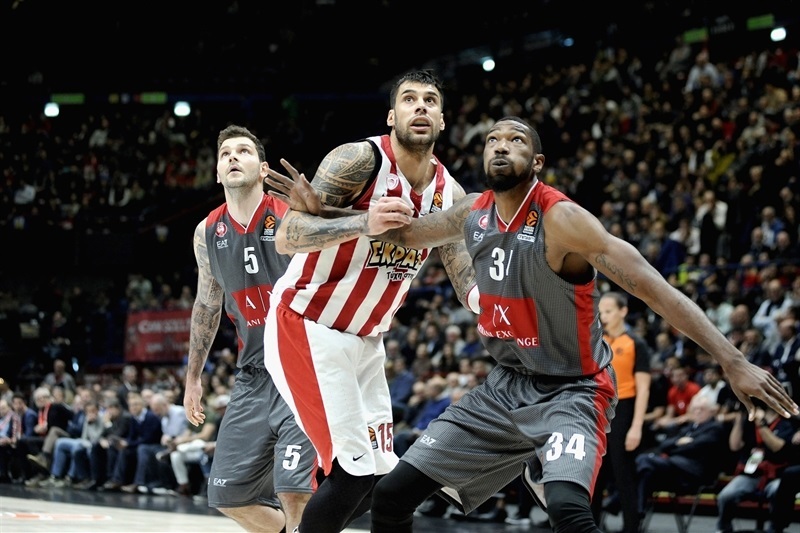 In a thriller that went down to the last shot, Olympiacos Piraeus escaped with an 85-86 victory over AX Armani Exchange Olimpia Milan as a former player for the hosts came up with the last of many big plays. 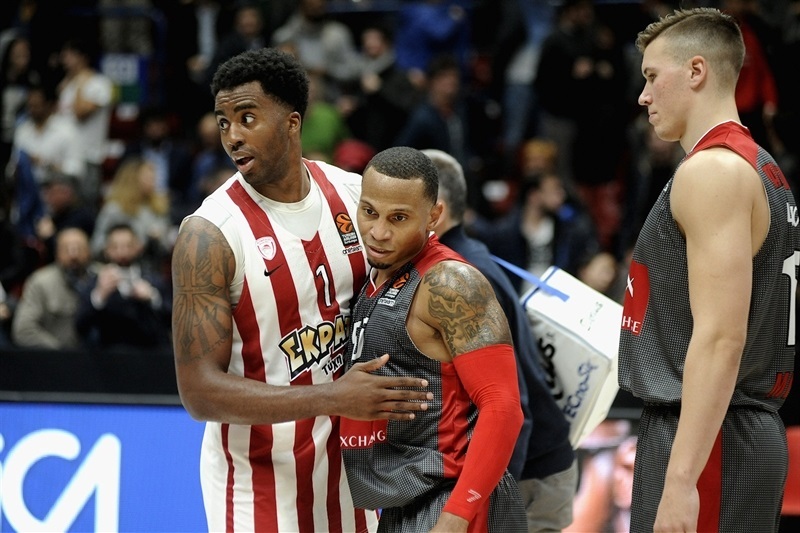 Olympiacos improved to 7-2 to retain a share of first place, while Milan fell to 3-6 when Curtis Jerrells failed to connect with the game's final shot. 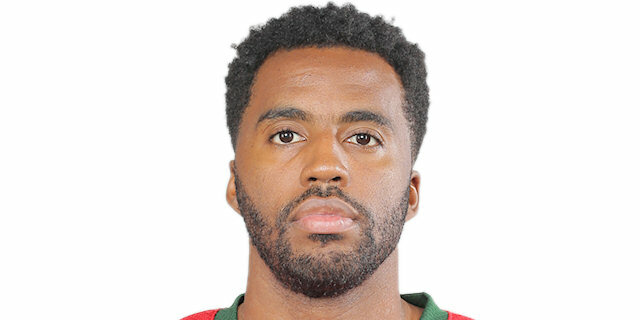 Jamel McLean led Olympiacos with 22 points and 7 rebounds against his old team, including a three-point play with 46 seconds left that provided the game's final points. 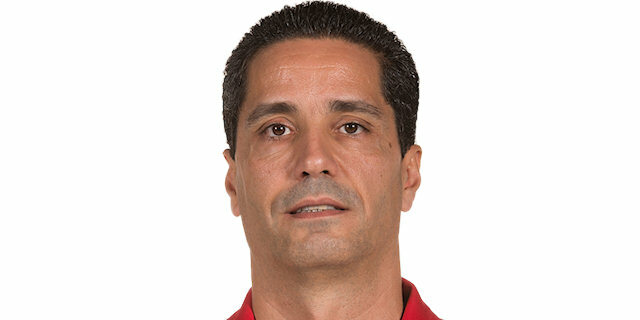 Brian Roberts followed him with 18 points, while Janis Strelnieks scored 14 and Kostas Papanikolaou 11 for the winners. Milan got 20 points from Jordan Theodore and a double-double of 19 and 10 rebounds from Arturas Gudaitis. Vladimir Micov added 15 points while Cory Jefferson had 10 and Kaleb Tarczewski had as many rebounds. 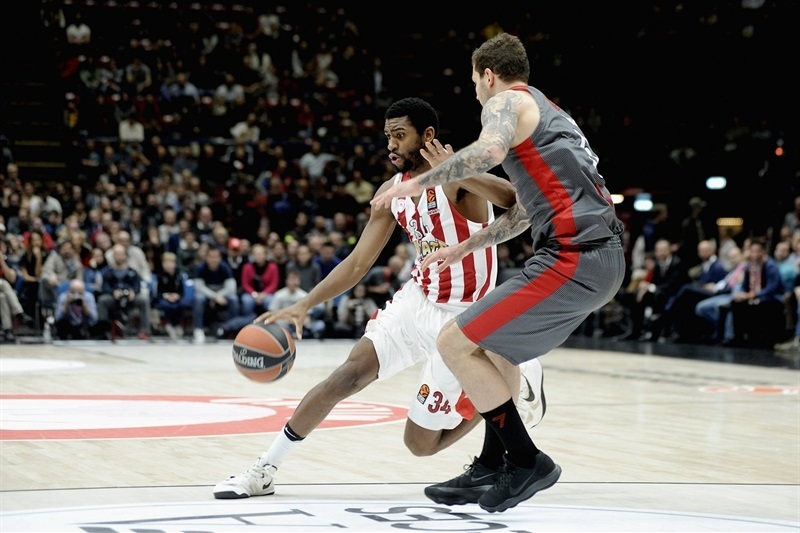 A game full of ties and lead-changes saw Olympiacos lead by 53-63 in the third quarter, only for Milan to go ahead twice in the last 1:46 on driving layups by Theodore. McLean answered both and added a free throw on the second of those baskets to take the win from the team he played for the last two seasons. Micov's one-hander started the scoring, but Roberts bettered him from deep and continued to hit his team’s first 7 points. Theodore drilled Milan's first three-pointer and Jefferson a layup at 7-7. Strelnieks and Hollis Thompson soon joined the Olympiacos scorers to restore a 9-14 lead for the visitors. Tarczewski's strong rebounding led to a tip-in by Jefferson, who then made a go-ahead jump hook at 15-14. Theodore and Gudaitis upped the Milan lead to 19-14. Micov drove strong to make it a 12-0 run but Roberts stopped that with his second triple as the first quarter ended 21-17. Theodore's triple to open the second quarter restored a five-point lead. Papanikolaou stepped up for the hosts with 5 points in a row at 26-25. Gudaitis scored inside before Vangelis Mantzaris hit from deep and Jerrells got his first points at the free throw line to make it 31-28. But Strelnieks stepped up with a triple to tie, then broke two more even scores with free throws and a runner to make it 35-37. Georgios Printezis got his first points on a goaltending call and then danced along to baseline to feed McLean for an acrobatic slam, forcing a Milan timeout at 35-41. Tarczewski slammed his fifth offensive rebound already, but Mantzaris was back from the perimeter to make it 37-44. Tarczewski's next offensive board went out to Jerrells for a triple, but McLean responded with another rim-swinging dunk that Jordan answered with a layup as the half finished 42-46. 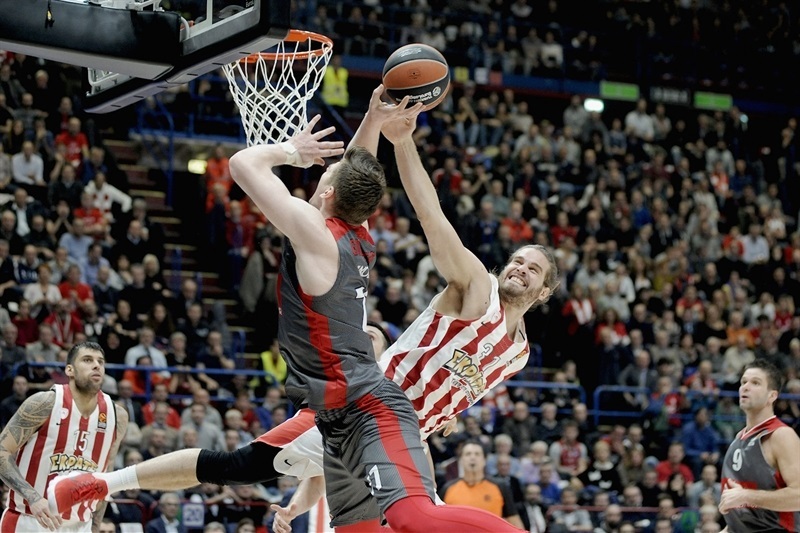 Tarczewski scored in traffic, drew Nikola Milutinov's fourth foul and completed the three-point play to get Milan within 45-46 to open the new half. McLean and Micov traded baskets before Roberts hit free throws and a jumper to make it 47-52. 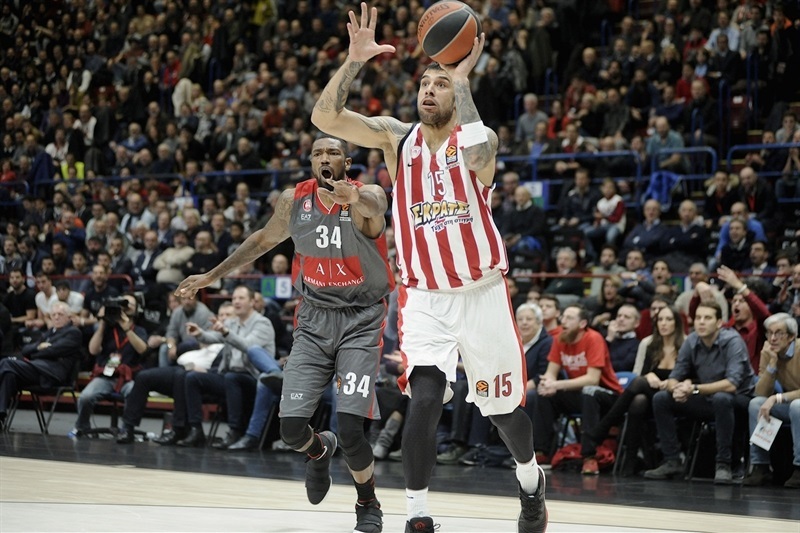 Jefferson rose for a super slam but soon Printezis was measuring a three-pointer to make it 51-57 for Olympiacos. Baskets by Ioannis Papapetrou and McLean made it 53-63, the game's biggest lead, but Micov answered and Jefferson hit free throws to trim the difference. Mantas Kalnietis and Theodor trimmed it further with a driving layups as the third quarter ended 62-66. McLean opened the fourth quarter with a baseline jumper that Gudaitis matched with a drive. Roberts kept Olympiacos ahead, but not for long as Gudaitis rocked the rim and Davide Pascolo hit a drop-back rainbow at 69-70 with under 7 minutes left. After an Olympiacos timeout, Pascolo assisted Micov on a go-ahead three-pointer. Roberts tied it at the foul line, 72-72, but Gudaitis wouldn't be stopped and finished a three-point play. Printezis and Gudaitis traded inside baskets before Papanikolaou drilled a triple for another tie, 77-77, with 4 minutes to play. 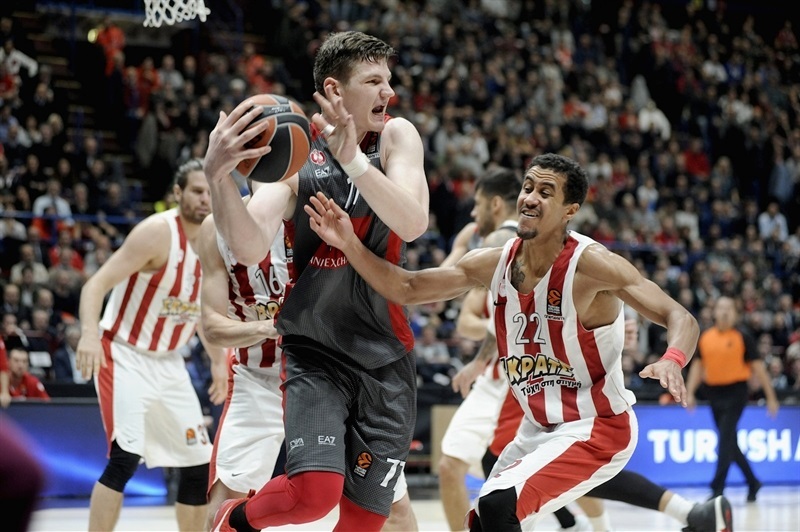 Gudaitis and Thompson hit free throws before a pair by Papanikolaou put Olympiacos up 79-81. Gudaitis came off the bench to tie it with yet another dunk, then Theodore rolled in the go-ahead jumper. McLean hung in the air for another tie, 83-83, with 1:24 left. Theodore danced for his layup and McLean did the same, but got fouled and made the free throw to make it 85-86 with 46 seconds left. Milan missed twice at the other end and the hosts sent Papanikolaou to the foul line with 15.5 seconds left. 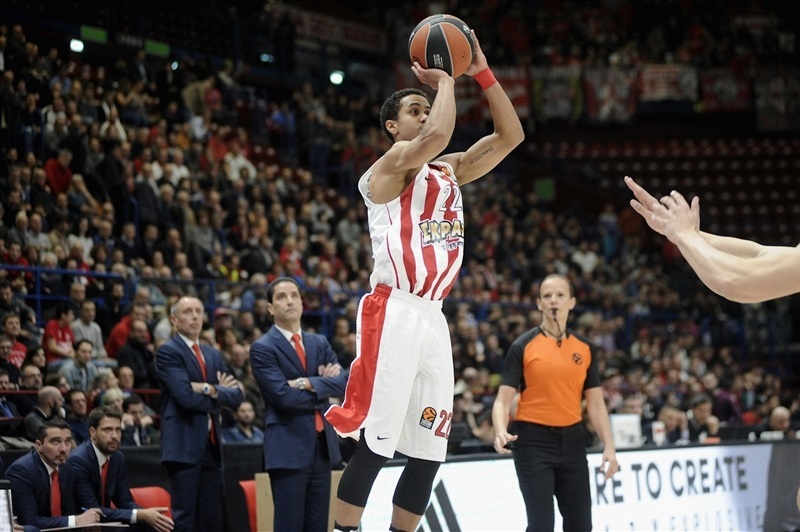 He missed both chances, but Jerrells was well-guarded on the last shot as Olympiacos preserved a one-point victory, 85-86. "I can only say good things about my players. They executed the plan, they won every quarter with the exception of the second. That upset me because we hesitated a little bit, we renounced a couple of shots. But overall it was a great game, we found a way to score against their defense and we lost because of a couple of details, including on the last possession when we had to drive since they were in the penalty and up by only one. It's disappointing because we lost another game against a great team that we deserved probably to win. And the guys deserved better luck." "I think we improved our defense in the second half and also the defensive rebounds. Although we got the lead in the third period, 10 points, Armani was better in the beginning of the fourth. They scored some easy points. Then the game was a derby til the end. We defended the last three or four minutes very good. We didn't allow them to score, and I think we won a very tough game against a very good team." "It was a good game by all of us, coming in here we knew to expect a tough game. Tonight the ball just found me ... my teammates encouraged me, but all of them played well. It's hard to explain. I was presented with the opportunity and I did the best I could. It's basketball, some days the shots go in and some they don’t . But the team is above all We played well as a team... Coach had shown us three Milan games, in which they came back in all three, with Bamberg down 17, returning and winning. We would never have won the game if at any time that we made the mistake of believing that it was over." "This was a big-time win. We didn't play the fist half as well as we could defensively. We gave up a lot of offensive rebounds. We wanted to try to fix that, and I fell like we did in the second half and came out with the win. It's a big-time win for Jamel McLean to come back and have a game like he did. We're happy for him, but this was just a great team win. Obviously he stepped up, and he and other guys made plays when we needed them."